It was 1954 in a northern Wisconsin kindergarten class as Tom Jolin walked round and round singing, “Oh where oh where has my little dog gone”, in a game of “Guess what I am”. He was a record player and even though it was a thoughtful performance, no one guessed it. Some careers have auspicious starts; others don’t. 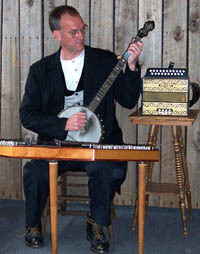 Tom plays traditional American music and has recorded six albums. He was a founding member of the West Orrtanna String Band which was active from 1972 to 1987. They recorded two albums on Revonah Records and also several short historic folk music segments for National Public Radio. From 1987 to 1998 he performed with the Orrtanna Mountain Steamers, which recorded two more albums. He is currently a member of the duet, Orrtanna, which also released an album. Since 1980, he has played with The Barnstormers, an old time duet. He has been a solo performer since 1978, playing the hammer dulcimer, button accordion, banjo, harmonica and more. He released a solo album in 2003. He has performed for former Vice President Gore and also, Garrison Keillor. His performances are loaded with humor, sometimes intentionally. Tom is also an experienced instrument maker. He is a sought after Pennsylvania artist in residence and spends extended times in various schools, assisting students make their own school owned dulcimers. owner-built home in the foothills of the Appalachians near Gettysburg.